51508-RB is rated 4.7 out of 5 by 3. Rated 5 out of 5 by Cindy from Perfect High quality shower head and bright chrome finish. The design compliments the English telephone hand held on my slipper tub. The long chromed stainless hose allows for easy reach rinsing down shower walls. It's 5 function head has precise D dents for positive spray adjustments and the non slip grip material is perfect for soapy hands. Beauty and function. Rated 5 out of 5 by William from nice hand shower Second one I purchased loved the first one so when renovating second bath I installed same one. Rated 4 out of 5 by royk from Works great. Only con is the hand shower is very heavy. Recommend making shower head smaller (it won't make it less effective) and lighter. The hand held shower head is way too heavy. My grandkids and wife have a little difficulty using it. I assume that an elderly frail person would also have problems using it. Purchased this shower head and find the water pressure extremely low. Very disappointing. Does the shower head have restricted and if so how many? We have just installed the 51508 Handheld Shower System and Love It! My question involves the angle of the handheld. Is the holder adjustable, not to slide but to direct the spray while on the wall at various angles? Presently it sprays out of the shower. Is this shower head metal? Does &quot;UP&quot; have to be up? I am installing the 51508 in a shower remodel. The shower bar is labeled with an &quot;up&quot; direction which places the slide bar knob on the left and the handheld holder on the right. However I can see no technical reason it could not be installed &quot;upside down&quot; in order to have the knob on the right and the handheld holder on the left. What are the ramifications of installing it upside down in order to have the knob on the right? Can the Slide Bar double as a grab bar for an elderly person? Thank you for your question. 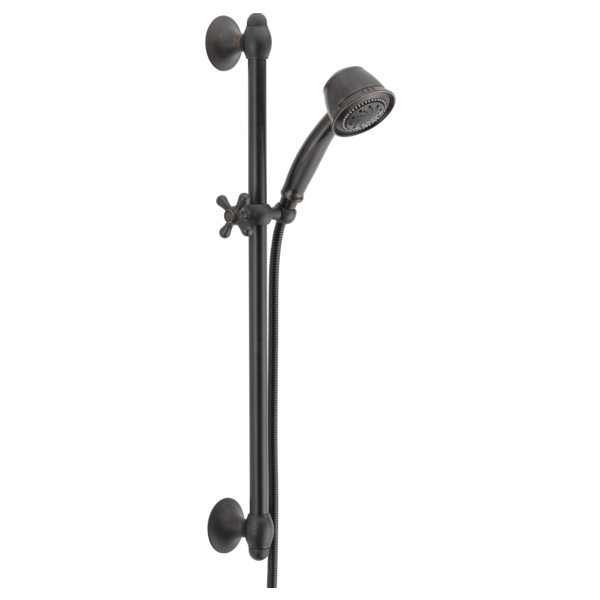 Delta Faucet model # 51508 is made as a slide bar. We do not recommend it as a grab bar for anyone. We do manufacture grab bars with showerheads. Use Slide Bar Hand Shower as Only Shower Head? I want to use this as the only shower head in my walk-in shower. I am not sure what other products I need to make it functional. For example, does it come with a valve (?) with handle to turn the water on/off. This is a stand-alone shower, and there is no bathtub and no stationary shower head to switch back and forth between. The water just needs to be directed to the handheld shower. I suspect I need to order some other parts to go with this hand shower. Would you please itemize what they would be (including part numbers---stainless steel, please).